The thorough knowledge of anatomical structures and landmarks are of paramount importance in dentistry. Let it be a dental implant in prosthodontics, surgical extraction of an impacted tooth in oral surgery, apicectomy and retrograde restoration in endodontics, gingivectomy, or flap surgery in periodontics, etc., adequate distance from vital anatomical structures are necessary to maintain normal function of the oral cavity. In mandible, important landmarks such as mental foramen, mandibular canal or inferior alveolar nerve canal (IANC), submandibular fossa, and mandibular foramen are of prime importance whereas in maxilla, floor of maxillary sinus or nasal cavity carry huge value. The variation in their structure, anatomy is a challenge for dentists as they may show the disparity in person-to-person. IANC has superior and inferior borders which carries neurovascular bundles. Inferior alveolar nerve (IAN) may be directed anteriorly or inferiorly from the mental foramen forming loop by curving back termed as anterior loop of IAN. Computed tomography (CT), cone-beam CT (CBCT), and direct anatomical analysis are reliable diagnostic tools for assessing its position and exact location. CBCT has been proved slightly better in this regards since it provides fine details and less patient exposure as compared to CT. Moreover, it gives image without overlapping and distortion. In some studies, anatomical planes have been utilized as landmarks in determining the anterior limit of IAC. Thus, there should be some reliable method which helps in locating anterior loop of IAC. Solar et al., classified anterior loop into Type I, Type II, and Type III. In Type I, Y-shaped anatomy is observed while anterior loop is missing; in Type II, anatomy is T-shaped while anterior loop is absent; and in Type III, Y-shaped anatomy is seen, and the incisive branch is thicker as compared to main branch. 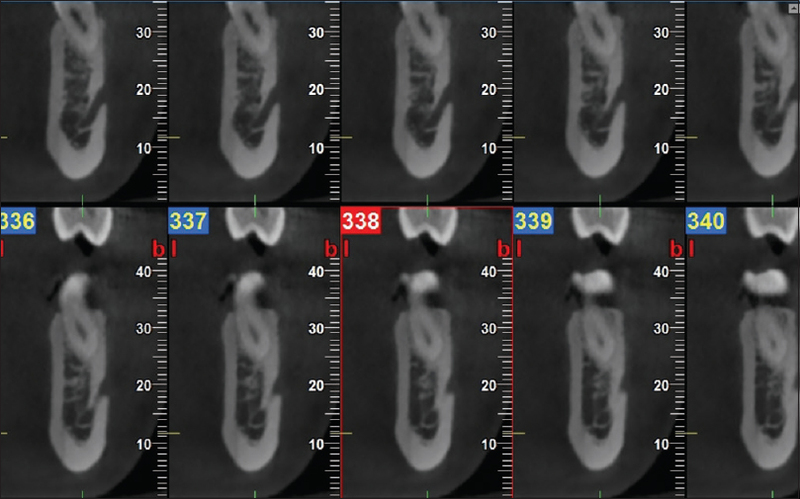 This study was conducted to determine variation in IAN loop with the help of CBCT. This study comprised 90 good quality CBCT images of patients visiting the Department of Radiology due to any complaint. All were informed regarding the study, and written consent was obtained. Ethical clearance was taken before the study. Patients with a history of some previous surgery in the mandible such as orthognathic surgery, operated cases of cysts and tumors in mandible, patients with developmental disorders, and trauma to mandible were excluded from the study. Poor quality images of no diagnostic value were not considered. In all patients, CBCT images were obtained using the same machine (Newtom) under standardized exposure parameter (85 kVp, 12 s, and 10 mA) with the field of view 8 cm × 11 cm. Sagittal, axial, and coronal sections were obtained [Figure 1], [Figure 2], [Figure 3]. Panoramic views were utilized for generation of sections [Figure 4]. All sections were evaluated by senior radiologist. Results are tabulated and subjected to statistical analysis using Chi-square test. A value of P < 0.05 was considered statistically significant. [Table 1] shows that of 90 patients, males were 40 and females were 50. The difference was statistically nonsignificant (P-0.5). The mean age in males was 38.6 ± 2.4 years and in females was 34.2 ± 1.6 years. The difference was statistically nonsignificant (P = 0.12). 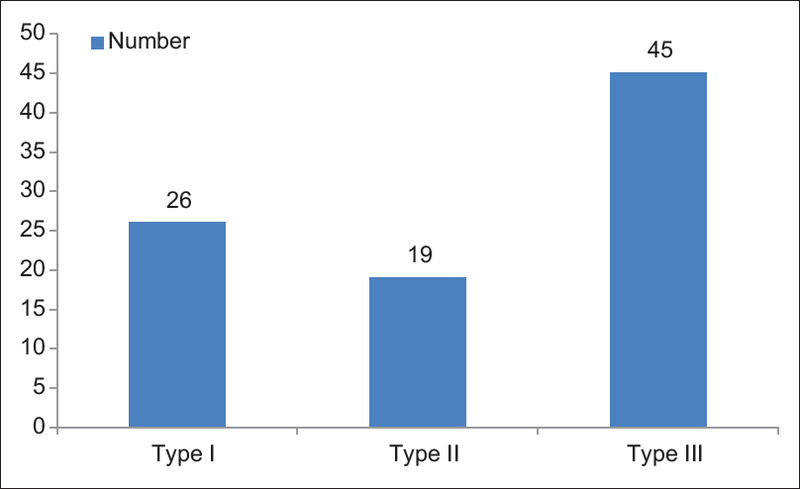 [Figure 5] shows that Type I pattern was seen in 26 (29%), Type II in 19 (21%), and Type III in 45 (50%) of patients. The difference was statistically significant (P < 0.05). 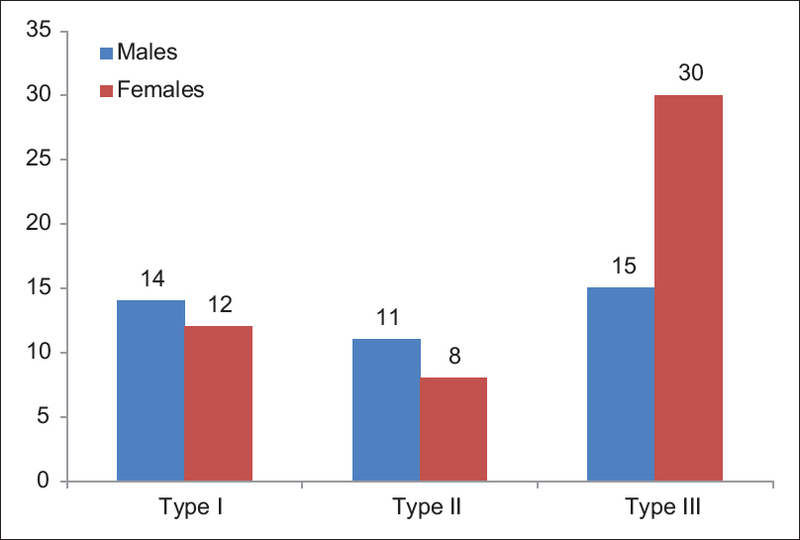 [Figure 6] shows that Type I pattern was observed in 14 (15.5%) males and 12 (13.4%) females, Type II pattern was seen in 11 (12.2%) males and eight females (8.8%), and Type III in 15 (16.7%) males and 30 (33.4%) females. There was a statistical significance difference between males and females in Type II (P < 0.05), whereas Type I and III did not show any difference (P > 0.05). The detection of IAC can be seen in various radiographs. Panoramic radiographs being two-dimensional (2D) cannot help in exact localization. The anterior loop of IAN may not be seen on panoramic images. With the advent of CT and CBCT, this has been made easier. Three-dimensional (3D) nature of CBCT is very effective as all the sections such as axial, coronal, and sagittal may be utilized in detection of the IAC. Any variation in its structure or morphology is evident in CBCT sections. Any shortcoming on other radiological view other than CBCT may be overcome by it. This has revolutionized the field of dentistry since the presurgical assessment has made easier with the CBCT, thus minimized the risk of complication which may occur due to poor assessment of anatomical structures such as IAC. A recent study by Li et al. in 2013, utilized spiral computer tomography in determining the prevalence, position, and length of IAC in a Chinese population. Another study by Kuzmanovic et al. assessed the anterior loop of mental nerve by radiological and morphological study. In this study, we involved 90 patients who were exposed to CBCT of the mandible to assess the IANC. It included 40 males and 50 females. We utilized axial, coronal, and sagittal sections and multiplanar reformation was done in detecting variation in patterns of IANC. The anterior loop of IAN showed Type III pattern in 50% of study population. The result of this study is in agreement with the study conducted by Demir et al. who conducted study on Turkish population to detect anterior loop of IAC using CBCT. Type I was seen in 29% and Type II in 21% of cases. We found that 15 males and 30 females exhibited Type III pattern (50%), whereas Type I was seen in 14 males and 12 females (28.9% subjects). Type II was seen in 19 patients (21.1%) (males - 11, females - 8). There was a statistical significance difference between males and females in relation to Type III pattern (P < 0.05), whereas other patterns were statistically nonsignificant (P > 0.05). Kaya et al. conducted a study to detect the anterior loop of IAN by comparing panoramic images with spiral CT and observed the lower prevalence of panoramic images as compared to spiral CT. The lower occurrence on panoramic may be explained by the fact that 2D nature of the imaging modality might miss the finer details whereas spiral CT showed higher prevalence rate. In this study, we utilized CBCT because it is quite cheaper as compared to CT. Moreover, it is beneficial regarding lower patient exposure, easy technique, and details are more evident. However, the only limitation with CBCT is low contrast and resolution as compared to CT.
Jacobs conducted a study on 545 patients using panoramic radiographs and found prevalence rate of 11%, much lower than that found in this study. Kajan and Salari conducted a study in the year 2012 on 84 Irani populations and found 36.9% occurrence of the anterior loop of IAN. De Oliveira-Santos et al. observed 22%–28% of prevalence rate. Solar et al. conducted a study to detected intraosseous path of the mental nerve and suggested that 1–10 mm of distance from anterior margin of mental foramen should be considered as safety margin. This much distance from the anterior loop is highly advisable as most of the complications may be avoided which are prone to occur due to lack of knowledge of its variation. However, there is no standardized protocol that may be followed. Wismeijer et al. have suggested 3-mm distance from mental foramen safety margin. The major complications such as paresthesia of the lower lip may be avoided by considering the safety margin. The placement of the dental implant anterior and posterior to this safety margin is beneficial for both patient and the operator. Filo et al. in their study, assessed the anterior loop of IAC at mental foramen and found it in >75% of patients. The bilateral occurrence was seen in most of the patients, thus suggesting CBCT as important radiographic aid before placing dental implant in the mandibular region, especially around premolars. Watanabe et al. in their study evaluated the mandible size and morphology through use of CT scan before placing implant. They suggested that CT analysis is very effective in surgical procedure, especially in the mandible. The approach of radiographic assessment of IAC and mental foramen was a crucial step in dental surgeries. Few authors have correlated the prevalence of anterior loop of IAN with gender, age, and side., Uchida et al. in their study found that males have a higher prevalence of IAC as compared to females., However, in this study we found its prevalence more in females, though the difference between gender was statistically nonsignificant. The measurement of the anterior loop of IAC was also done in their study, though we did not include this parameter in the present study. The need of 3D imaging was well appreciated. There is variation in the occurrence of IANC. The anterior loop of IAN is quite common. In this study, we found different patterns. The most common pattern recorded was Type III. Females exhibited higher prevalence than males. This may help in gender identification. However, large-scale studies are required to substantiate the results obtained in this study. CBCT proved to be useful in detection of the masked anterior loop of IAN. Agbaje JO, Sun Y, De Munter S, Schepers S, Vrielinck L, Lambrichts I, et al. CBCT-based predictability of attachment of the neurovascular bundle to the proximal segment of the mandible during sagittal split osteotomy. Int J Oral Maxillofac Surg 2013;42:308-15. Rosa MB, Sotto-Maior BS, Machado Vde C, Francischone CE. Retrospective study of the anterior loop of the inferior alveolar nerve and the incisive canal using cone beam computed tomography. Int J Oral Maxillofac Implants 2013;28:388-92. Suomalainen A, Kiljunen T, Käser Y, Peltola J, Kortesniemi M. Dosimetry and image quality of four dental cone beam computed tomography scanners compared with multislice computed tomography scanners. Dentomaxillofac Radiol 2009;38:367-78. Neiva RF, Gapski R, Wang HL. Morphometric analysis of implant-related anatomy in Caucasian skulls. J Periodontol 2004;75:1061-7. Greenstein G, Tarnow D. The mental foramen and nerve: Clinical and anatomical factors related to dental implant placement: A literature review. J Periodontol 2006;77:1933-43. Solar P, Ulm C, Frey G, Matejka M. A classification of the intraosseous paths of the mental nerve. Int J Oral Maxillofac Implants 1994;9:339-44. Li X, Jin ZK, Zhao H, Yang K, Duan JM, Wang WJ, et al. The prevalence, length and position of the anterior loop of the inferior alveolar nerve in Chinese, assessed by spiral computed tomography. Surg Radiol Anat 2013;35:823-30. Kuzmanovic DV, Payne AG, Kieser JA, Dias GJ. Anterior loop of the mental nerve: A morphological and radiographic study. Clin Oral Implants Res 2003;14:464-71. Demir A, Izgi E, Pekiner FN. Anterior loop of the mental foramen in a Turkish subpopulation with dentate patients: A cone beam computed tomography study. J Marmara Univ Inst Health Sci 2015;5:231-8. Kaya Y, Sencimen M, Sahin S, Okcu KM, Dogan N, Bahcecitapar M, et al. Retrospective radiographic evaluation of the anterior loop of the mental nerve: Comparison between panoramic radiography and spiral computerized tomography. Int J Oral Maxillofac Implants 2008;23:919-25. 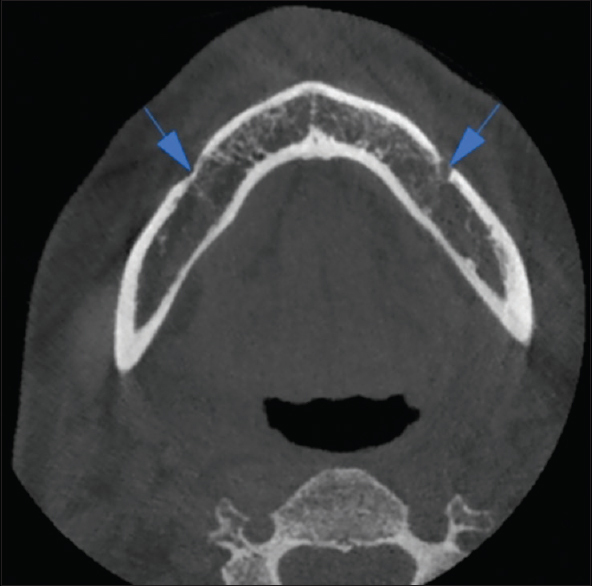 Jacobs R, Mraiwa N, van Steenberghe D, Gijbels F, Quirynen M. Appearance, location, course, and morphology of the mandibular incisive canal: An assessment on spiral CT scan. Dentomaxillofac Radiol 2002;31:322-7. Kajan ZD, Salari A. Presence and course of the mandibular incisive canal and presence of the anterior loop in cone beam computed tomography images of an Iranian population. Oral Radiol 2012;28:55-61.
de Oliveira-Santos C, Souza PH, de Azambuja Berti-Couto S, Stinkens L, Moyaert K, Rubira mental foramen and its implications for surgery. J Am Dent Assoc 2014;145:2-Bullen IR, et al. Assessment of variations of the mandibular canal through cone beam computed tomography. Clin Oral Investig 2012;16:387-93. Wismeijer D, van Waas MA, Vermeeren JI, Kalk W. Patients' perception of sensory disturbances of the mental nerve before and after implant surgery: A prospective study of 110 patients. Br J Oral Maxillofac Surg 1997;35:254-9. Filo K, Schneider T, Locher MC, Kruse AL, Lübbers HT. The inferior alveolar nerve's loop at the mental foramen and its implications for surgery. J Am Dent Assoc 2014;145:260-9. Watanabe H, Mohammad Abdul M, Kurabayashi T, Aoki H. Mandible size and morphology determined with CT on a premise of dental implant operation. Surg Radiol Anat 2010;32:343-9. Ngeow WC, Dionysius DD, Ishak H, Nambiar P. A radiographic study on the visualization of the anterior loop in dentate subjects of different age groups. J Oral Sci 2009;51:231-7. Liang X, Jacobs R, Hassan B, Li L, Pauwels R, Corpas L, et al. A comparative evaluation of cone beam computed tomography (CBCT) and multi-slice CT (MSCT) part I. On subjective image quality. Eur J Radiol 2010;75:265-9. Uchida Y, Noguchi N, Goto M, Yamashita Y, Hanihara T, Takamori H, et al. Measurement of anterior loop length for the mandibular canal and diameter of the mandibular incisive canal to avoid nerve damage when installing endosseous implants in the interforaminal region: A second attempt introducing cone beam computed tomography. J Oral Maxillofac Surg 2009;67:744-50.